HEC-RAS is designed to perform one and two-dimensional hydraulic calculations for a full network of natural and constructed channels. The following is a description of the major capabilities of HEC-RAS. 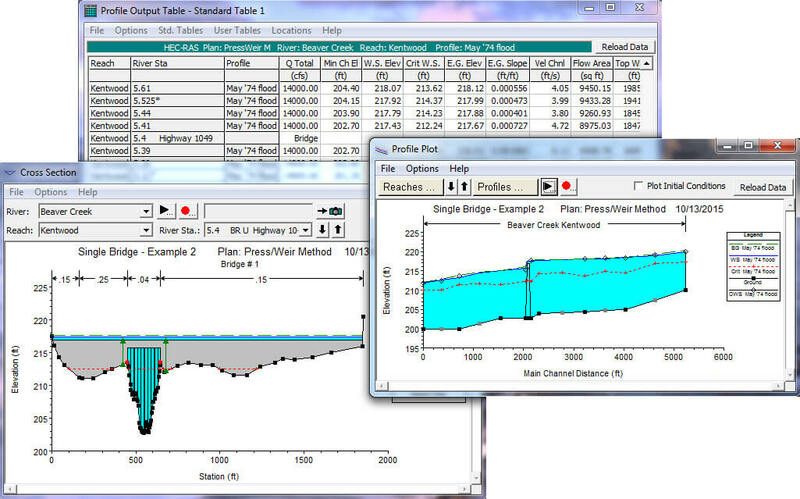 The HEC-RAS system contains several river analysis components for: (1) steady flow water surface profile computations; (2) one- and two-dimensional unsteady flow simulation; (3) movable boundary sediment transport computations; and (4) water quality analysis. A key element is, that all four components use a common geometric data representation and common geometric and hydraulic computation routines. In addition to these river analysis components, the system contains several hydraulic design features that can be invoked once the basic water surface profiles are computed. downs) calculations in the unsteady flow computations module. The hydraulic calculations for cross-sections, bridges, culverts, and other hydraulic structures that were developed for the steady flow component were incorporated into the unsteady flow module. Special features of the unsteady flow component include: extensive hydraulic structure capabilities Dam break analysis; levee breaching and overtopping; Pumping stations; navigation dam operations; pressurized pipe systems; automated calibration features; User defined rules; and combined one and two-dimensional unsteady flow modeling. 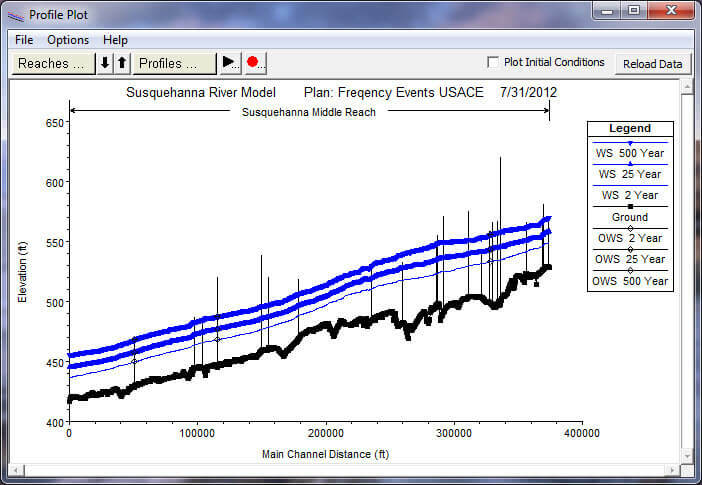 This component of the modeling system is intended to allow the user to perform riverine water quality analyses. An advection-dispersion module is included with this version of HEC–RAS, adding the capability to model water temperature. This new module uses the QUICKEST-ULTIMATE explicit numerical scheme to solve the one-dimensional advection-dispersion equation using a control volume approach with a fully implemented heat energy budget. Transport and Fate of a limited set of water quality constituents is now also available in HEC-RAS. The currently available water quality constituents are: Dissolved Nitrogen (NO3-N, NO2-N, NH4-N, and Org-N); Dissolved Phosphorus (PO4-P and Org-P); Algae; Dissolved Oxygen (DO); and Carbonaceous Biological Oxygen Demand (CBOD). For details on how to use the water quality capabilities in HEC-RAS, please review Chapter 19 of the User's Manual. other programs by utilizing the HEC-DSS. filename for the project being developed. Once the project filename is entered, all other files are automatically created and named by the interface as needed. The interface provides for renaming, moving, and deletion of files on a project-by-project basis. and inundation mapping. A three-dimensional plot of multiple cross-sections is also provided. Inundation mapping is accomplished in the HEC-RAS Mapper portion of the software. Inundation maps can also be animated, and contain multiple background layers (terrain, aerial photography, etc…). Tabular output is available. Users can select from pre-defined tables or develop their own customized tables. All graphical and tabular output can be displayed on the screen, sent directly to a printer (or plotter), or passed through the Windows Clipboard to other software, such as a word-processor or spreadsheet. Reporting facilities allow for printed output of input data as well as output data. Reports can be customized as to the amount and type of information desired. HEC-RAS has the capability to perform inundation mapping of water surface profile results directly from HEC-RAS. 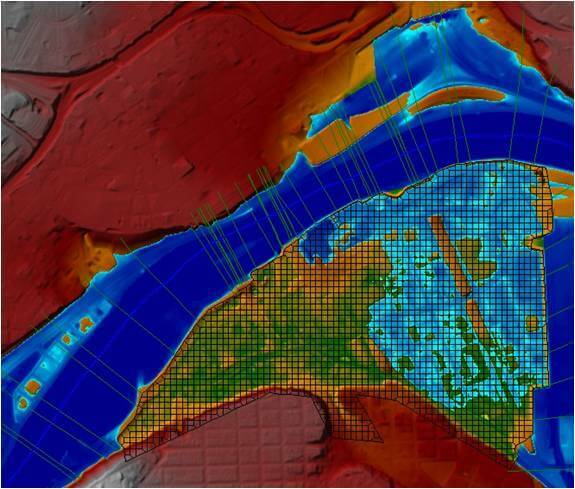 Using the HEC-RAS geometry and computed water surface profiles, inundation depth and floodplain boundary datasets are created through the RAS Mapper. Additional geospatial data can be generated for analysis of velocity, shear stress, stream power, ice thickness, and floodway encroachment data. In order to use the RAS Mapper for analysis, you must have a terrain model in the binary raster floating-point format (.flt). The resultant depth grid is stored in the .flt format while the boundary dataset is store in ESRI's Shapefile format for use with geospatial software.